During my time away I have been training and did one race. I kept putting off my race report for the Toughman Arizona (formerly Deuceman) in Show Low, Az. while I thought about what I wanted to write. My race execution was average. 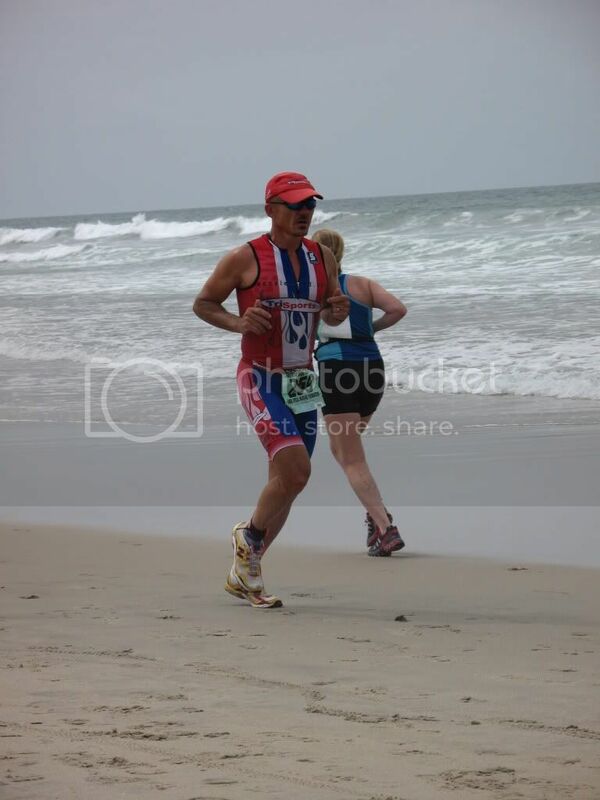 I finished 2nd in the 50-54 agegroup and managed a 14th place overall. I had a good swim which was shortened due to the lakes extreme low level. My bike went very good. Then I wilted away in the heat on the run but soldiered on finishing in 5:08:02. Now the race directors perfornance…not so good. I sent a lenghthly note to the RD explaining my displeasure with a list of problems that needed to be fixed. Lack of porta potties, running out of water, running out of cups, lack of mile markers, the worst awards ever, and many other problems. Some of these have already been addressed by the RD (They sent out new and improved awards). I am hoping the others will be corrected for next year to bring this once great race back up to the high standards that were set by TriSports Racing. Since the race, I have taken a few weeks of recovery time and have now started my build up for my Ironman. Last month (July) saw me log 30.3 miles in the pool, 830.01 miles on the bike and 152.36 miles of running. The fun continues! 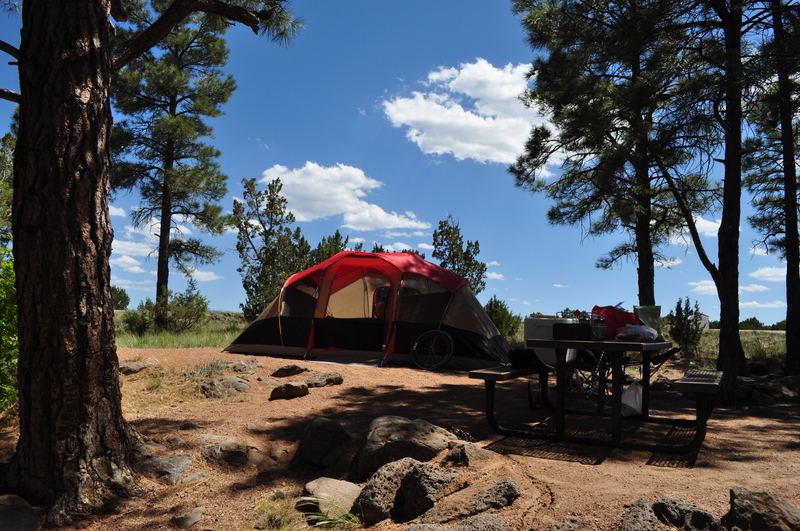 Friday May 31 I packed my race and camping gear into the truck and made the drive to Show Low, Arizona along with my support crew (wife and dog). From 2600ft to 6400ft elevation. 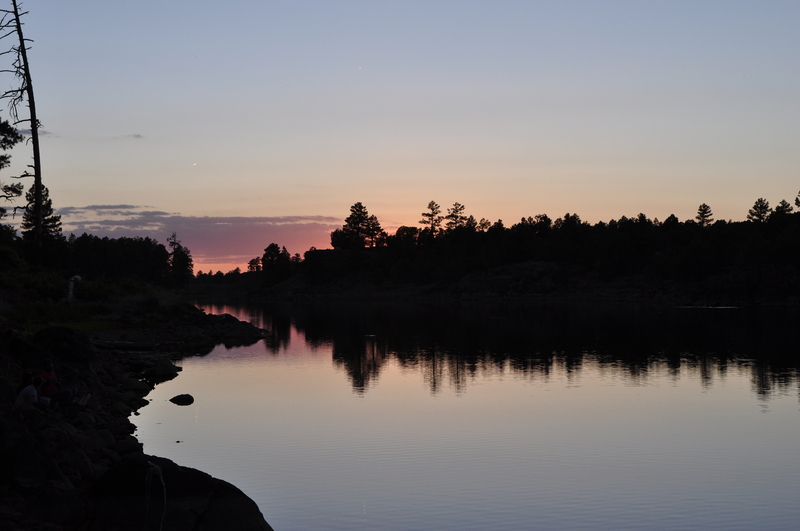 After arriving, I set up camp at Fool Hollow lake under the pines. After a little relaxing I rode my bike down to the race venue (about 3/4 mile from camp) and picked up my race packet. After riding back to camp I enjoyed a pasta dinner with a view. Final prep on my gear and then a little more relaxing as the sun set over the lake. Early to sleep, early to rise. Alarm woke me at 5. A quick breakfast of 2 bananas and a blueberry bagel. 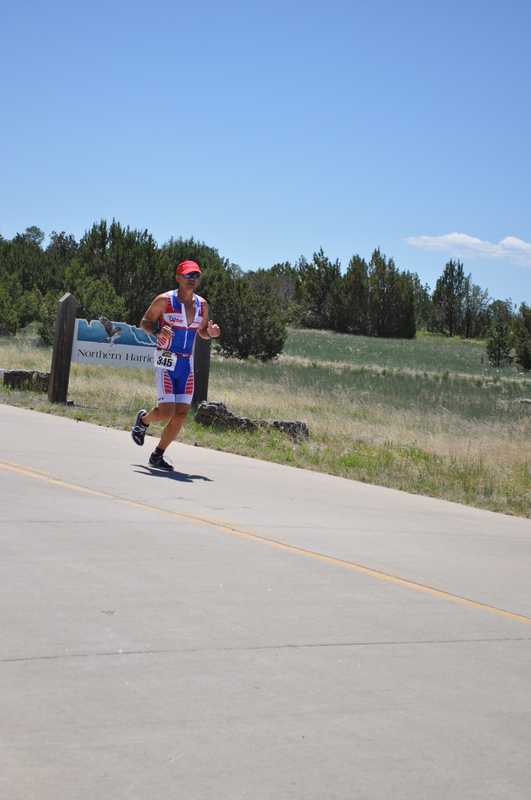 I then grabbed my TriSports.com TYR gear bag and rode down to the transition area. I racked my bike and set up my gear in my assigned spot. Body marked #345. After a little socializing it was time to squeeze into the wetsuit and head down to the boat ramp for the race start. On the way down I slurped down a gel. I had been told the day before that water tempature was a brisk 57 degrees. As I entered the water to warm up I was expecting the cold shock on my face. It never came. water felt like it was at least mid 60’s…perfect for a wetsuit swim. I did a short warmup and then found my spot on the start line. 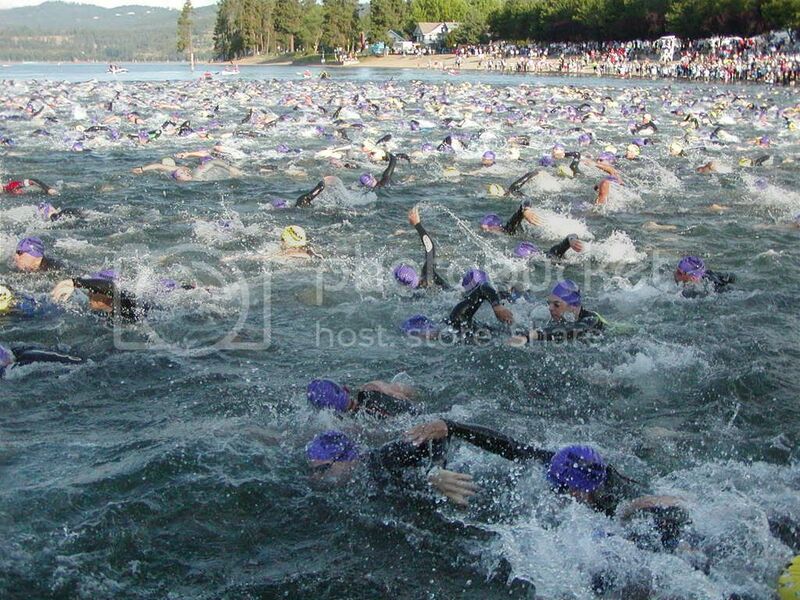 At 7am the start horn sounded and we were off for a 1.2 mile 2 lap triangle shaped swim. I quickly got into my pace and felt good during the swim. I swam straight along the buey line. The 2 loop swim made the swim seem to go by quicker. I had clean water for nearly the entire swim. You definately have to pace yourself at 6400 feet elevation. I hit land in 32:35. A solid time for me. I hit the wetsuit strippers and they yanked my wetsuit off in one swift yank. Then it was a run up the boat ramp into the transition. The run up the ramp is an anarobic venture! In and out of transition in 0:44…goggles,wetwuit and cap on the ground, helmet on, go. I ran to the mount line and threw my leg over the bike. The mount area is uphill! It took 2 attempts to get going with enough momentom to get my other foot on the shoe. Once under way I slipped my feet into my shoes and then got up to speed. The course is a single lap of 56 miles (my garmin shows it a bit over 57). The first 40 miles are big rollers and gusting side winds. I was feeling good and picking off some of the speedy swimmers. At mile 40 you turn into the town of Taylor and begin a 10 mile climb back to Show Low. The wind became tail wind and the sun began to heat up. The tail wind created a vacuum affect and made the heat feel even hotter. I was still feeling good and picked off a few more people. After getting back into town there are a few more rollers and then a nice downhill the final couple miles. As I approached the transition I slipped out of my bike shoes. I hit the ground running at the dismount line after a 2:35:10 split. During the bike I consumed a large bottle of gatorade, a bottle of water and my consentrated mix of Carbo-Pro. I racked my bike, helmet off, socks and shoes on. I grabbed my hat, sunglasses and number belt and was out of transition in 1:15. I finished getting “dressed” on the go. The 13.1 mile 2 loop run is slightly rolling with a combination of groomed trail, cement road and dirt road. The first 1.5 miles of trail running I felt fairly good. As I exited the trail onto the cement in the campground a nasty little hill brought out the cramping in my legs. I backed off the pace to try and get the cramps under control. At the top of the hill I stopped and took a few seconds to try to strech out the legs. This relieved the craamps for a short period but then they returned. I took in water and gatorade at the aid stations and downed salt tablets. As I hit the out and back section, lovingly refered to as the “death road” due to its lack of shade, my pace was slow but I was still moving forward. After the death road you return along the lake, climb one more hill and then do it all over again. As I started out on the second loop my energy levels were low. In my focus on getting rid of my cramps I had neglected to take in any fuel other than the gatorade. As I hit the first hill aafter the trail I was slowed to a near walk. I took in a gel at the next aid station and continued to get liquids in me. The next aid station I took in another gel. Just as my energy levels started to return the fluids in my stomach began to slosh around…not a good feeling. I struggled through the second trip through the death road. The sun was much more intense this time. As I returned to the campground/lake area I just wanted to get to the finish line. I had lost quiet a few places as i was being passed during my meltdown. Full on damage control. 1:58:23 and my “run” was over. I crossed the line in 5:08:44. I had held on for 14th overall and 3rd in my agegroup. It wasn’t my best day out there but I hung on to finish. A nice dip in the lake afterwards was refreshing although a bit chilling without a wetsuit. On Sunday I backed up my race with volunteering at the Xterra race. On sore legs I spent the morning body marking and then kept everyone on the correct path on the run. On Thursday Sep. 6 I celebrated my 48th year in this world. 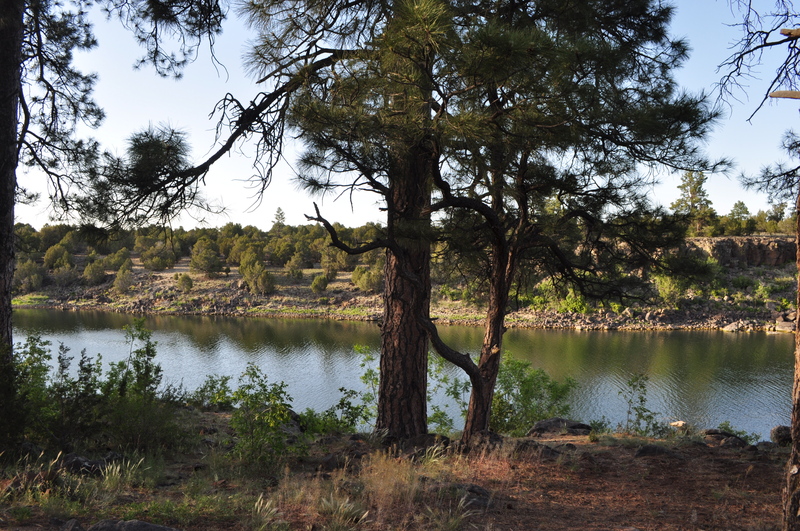 The following morning I packed my truck and headed up to the pines and high altitude of Show Low, Az. It was time for the Deuces Wild Triathlon Festival weekend put on by TriSports.com. The weekend includes an olympic distance triathlon and half ironman distance triathlon on Saturday followed by an xterra off-road triathlon on Sunday. I would be racing the half ironman on Saturday. I arrived at Fools Hollow lake in the afternoon after a scenic 4 hour drive. I set up my camp site amongst the pines and within view of the lake. I then went to packet pick-up and then enjoyed a nice pasta dinner cooked up and served by the local school. I returned to camp and put the finishing touches on my race gear. As the sun set I relaxed a bit and then slipped into my sleeping bag for an early night of sleep. I slept intermittently throughout the night. I seemed to wake up every hour or two. My alarm was set for 4:30 however I awoke on my own at 4:15. I decided to get an early start on my morning. I ate a blueberry bagel, a banana and a “salty nut bar” for breakfast. I got dressed then through my gear backpack on and rode the 2 miles to the transition area by the light of my flashlight. The cloudy night kept the temperatures warmer than usual and the ride was a nice warm-up. I found a nice end spot on the racks and set up my gear. I got body marked then payed a final visit to the porta-potty. After a little socializing I slipped into my wetsuit and headed to the water. The water was a much warmer than usual 72ish. I jumped in and got a good 15 minute warm-up in. It was about GO time. As the national anthem was about to play there was some technical difficulties…no sound. As if planned the athletes bobbing in the water began to sing an impromptu version of the Star Spangled Banner…and a pretty good one at that! The horn blew and off we went. I quickly found clear water and began my journey to the first turn buoy. The swim course is a 1.2 mile uneven triangle. The warm water and cooler air decided to wreak havoc on my goggles…they fogged. I was swimming blind. I had to stop 5-6 times to clear my goggles. Each time I would have clear goggles for about 10 stroke then swim as far as I could with diminished view, clear, repeat. I felt comfortable throughout the swim. I made the final turn into the cove and headed straight to the boat ramp. A quick stop at the “strippers” and a run into T1. The thin air made that short run one of the hardest parts of the race…totally anarobic! T1…short and sweet. Goggles and cap off, helmet on. Grab bike and go. I mounted my bike and slipped into my shoes. The bike is a 56 mile hilly affair. The first 15 miles is big rollers, followed by 25 miles of downhill rollers, an 8 mile gradual climb and then more rollers into the bike finish…2567 feet of climbing (Garmin). I was having issues with my rear derailuer throughout the ride. It would periodically “jump”. It was more of an annoyance than anything. I was continually looking for a “sweet spot” to prevent the jumping. I maintained a strong pace throughout the ride and felt strong. I consumed my nutrition like clockwork…a small bottle of gatorade with 1 scoop of Carbo-Pro for the first hour, a large bottle of gatorade with 7 scoops of Carbo-Pro and half a bottle of gatorade from the aid station over the remainder of the ride. Coming into the final stretch I began to prep for T2. I slipped my feet out of the pedals, eased up a little and stretched out the legs. As I hit the dismount line I threw my leg over the bike and hit the ground running. Into T2 I racked my bike, removed my helmet, put on my running shoes, grabbed my number belt, hat and glasses and hit the run. 13.1 miles and 633ft of climbing separated me from the finish line. My legs felt great. The run is a 2 loop course. It begins by following a trail along the lake, then kicks up a steep little hill through the camp grounds, a rolling out and back on a dirt road and then road back to the 2nd loop/finish. The first loop went pretty easily. I was averaging around 7:40 pace and taking in gatorade and water at every aid station. The second loop the sun made an appearance and warmed things up a bit. The 5600ft elevation also began to take its toll. The pace dropped into the low 8 minute, mid 8’s then high 8’s. With three miles to go I decided to walk through the aid station, took a gel, two cups of gatorade and a cup of water to try to revive myself for the finish. I was then off maintaining mid 8 minute pace to the finish. Crossing the finish line I was handed an ice-cold popsicle! Awesome! Great race, scenic and challenging course and a great $40,000 raffle at the awards! On Sunday I was again up bright and early. After packing up my camp gear it was time to volunteer in the transition area for the Xterra triathlon. There was obviously a bit of mud on the bike course but they got to clean up before the finish with a run that included a waist deep water crossing in view from my spot! Deuceman…wind, wind and did I say wind? 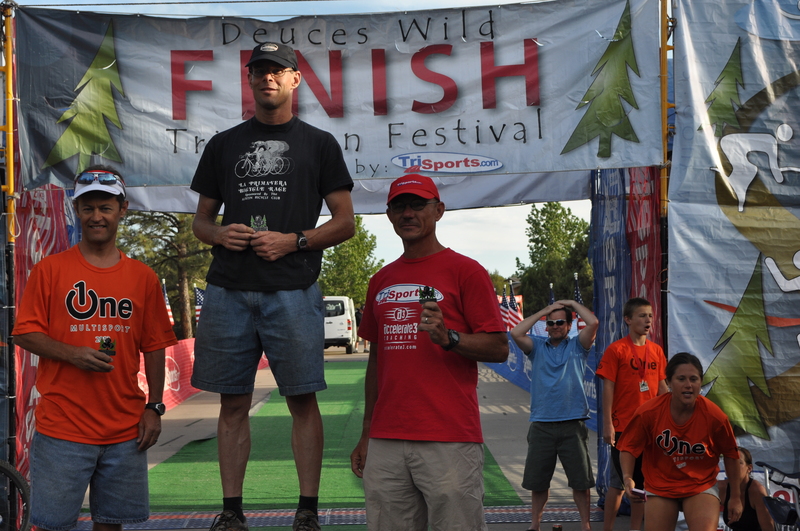 This weekend was the Deuces Wild Triathlon weekend in Show Low, Arizona. Saturday’s festivities included the olympic distance and half ironman distance triathlons and today was the xterra triathlon. My weekend included the half ironman followed by volunteer duty for the xterra. I arrived in Show Low on Friday afternoon. Show Low is in the White Mountains of Arizona and sets at just under 6500 ft elevation. In the near distance a large plume of smoke was visible from one of Arizona’s largest wild fires in the state’s history (as of today the 3rd largest and still 0% contained). The winds were blowing hard and were forecast to continue through the race on Saturday…oh joy! After arriving at the race venue, Fools Hollow lake, I picked up my race packet and then proceeded to find my camp site. My camp site was less than 2 miles from the race, nice and convenient! I set up my tent and then relaxed in the shade. I made a quick trip into town to do a bit of race meal shopping. My camp “neighbors” were quite entertaining…think of the old Honeymooners t.v. show. Unfortunately they were also quite loud! But, my ipod cured that. I put the finishing touch’s on all of my gear and double checked that I had everything. I then went and visited with some friends that were camped nearby. Back at camp early, I turned out the lantern, crawled into my sleeping bag and was sleeping by 9. Race morning my alarm went off at 4:15. I crawled out of my sleeping bag to find that it was pretty cold. I quickly found a blanket and wrapped up in it while I ate breakfast…yoguart, a banana and a wheat bagel. I threw on my TriSports.com/Accelerate3 race kit and topped it with a warm up suit. 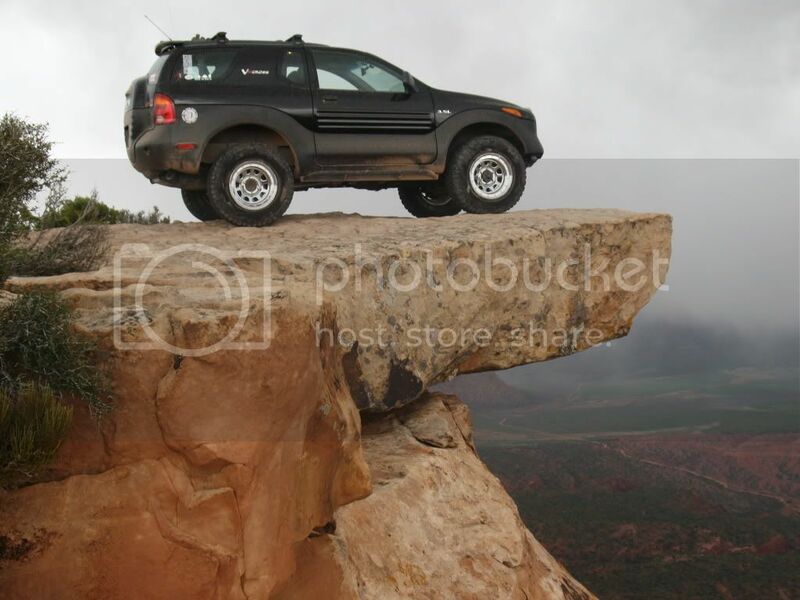 I topped off the air in my tires. I then threw my gear backpack on my bike and took the chilly ride down to the transition area. This year rack positions were assigned by race number. I found my spot on the 2nd rack and set up my gear. I talked to a few friends who were racing and then relaxed for a bit. About 6 I started to get in to my wetsuit. I walked down to the swim start to get a short warm up in. Water temp was low 60’s. A bit of a shock when entering the water. I was able to get in about 200 yards before they started getting everyone back to the start. After a short swim course talk the start horn sounded…no warning! Caught most of us by surprise but no one got an early start. We were off for the 1.2 mile swim. The first section of the swim curved to the right out of a small cove and went about 500 yards to the first turn buoy. The altitude, cold water and surprise start caused me to have breathing difficulties, a first in my 19 years of multisport racing. My chest felt constricted. I rolled over on my back and attempted to adjust my wetsuit to no avail. I rolled back over and focused on relaxing. After rounding the turn buoy I began to feel good again and focused on my stroke. My sighting was good and I swam straight along the buoy line to the 2nd turn buoy. This was the long leg of the swim and the buoy came quicker than I expected. I made the turn and began to head back to the cove. I rounded the corner and could see the boat ramp. As I exited I took a glance at my watch…the first 500 yards had cost me about 3-4 minutes! I stripped my wetsuit down to my waist as I ran up the ramp, plopped down and the “strippers” smoothly yanked my wetsuit the rest of the way off. Swim time…35:14, good enough for 4th fastest in the 45-49 agegroup. Transition 1 was quick and smooth…helmet on, grab bike, go! T1 time…1:40, fastest of my agegroup. I mounted my bike at the mount line got up to speed and got my feet into my shoes. I was off for the 56 mile bike. The bike course was rolling hills for the first 45ish miles then has an 8 mile grinding climb. It’s not steep but just keeps on going followed by a short rolling downhill. The wind was blowing at 40+ mph. It was a head or side wind the whole day until the final few miles. I felt strong the whole ride. I took in all my carb drink…2 large bottles with 6 scoops of carbo pro in each. At a couple of aid stations I grabbed water wash down the carbs. A few riders who passed me early in the ride made their way back to me before the long climb. About mid way up the climb the olympic distance race bike course ties into the half iron course. I began using them as targets to motivate me, picking them off along the climb. I made the turn back towards the transition and was rewarded with what seemed like the only tail wind during the day. About 100 yards from the dismount line I slid my feet out of my shoes, made the last 2 chicane like turns, and as I hit the dismount line hopped from my bike running. I made my way through the chute and into the transition area. 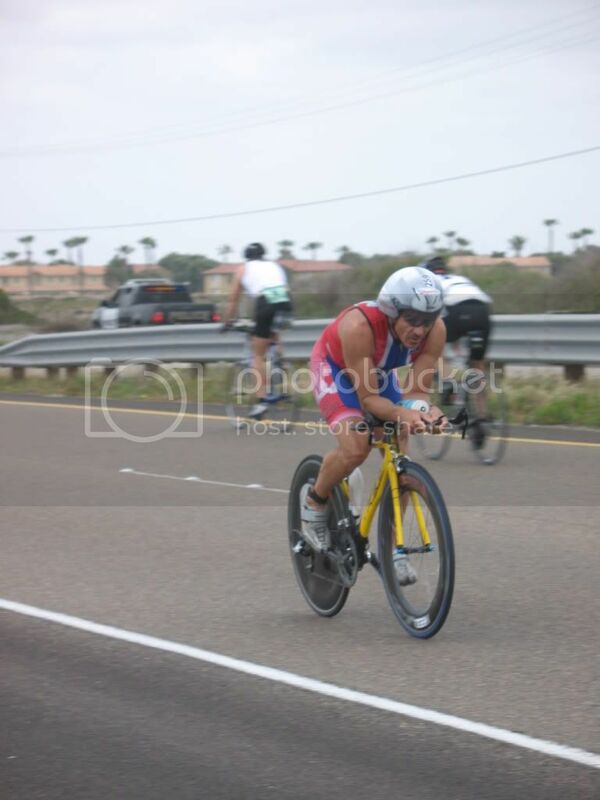 Bike time…2:43:57, fastest in my agegroup. Once again transition went smoothly. Hung the bike on the rack, helmet off, running shoes on, grabbed my hat, sunglasses and number belt and off I went on my 13.1 mile, 2 loop tour of the lake and campground areas. As I ran out of T2 I put on my sunglasses, hat and belt. The first loop of the run I planned on going easy so that I’d have some fuel in the tanks for the second loop. The first couple of miles along the lake was windless and hot. The late morning sun had warmed to the mid 80’s. I maintained a strong but comfortable pace. As we climbed out of the lake area into the campgrounds the wind came back and helped to cool me along with the shade of the tall pines. I wound my way through the campground and then began the out and back section of the loop. I was able to see the competition and saw no one that looked to be in my agegroup. After the out and back there is a short downhill followed by an uphill that took me back near the finish line. At that point the olympic distance guys turn for the finish and us half iron guys veer off for another short out and back. I asked the volunteers how many had gone through the out and back and was told 10 to 15. Not to bad. We then ran by the transition area and began the 2nd loop (a repeat of the first minus the short out and back section). My legs were feeling good so I picked up my pace a bit. Once again there was no wind and lots of heat around the lake area and wind on the high section. I made my way through the campground, the out and back and then up the final hill…this time to make the turn into the finishing shoot. I crossed the finish line and received the best thing ever….a nice, icy cold popcicle!My legs were jello! My T2/run time…1:49:11, 3rd fastest in my agegroup. Overall time…5:10:04, 1st place 45-49, 15th place overall male and 17th place overall (yea, I got chicked x2). Today (Sunday) I was again at the race site early after breaking down my camp and packing everything in my car. Began the day feeling pretty good. I directed transition traffic for the xterra race. As the morning progressed the muscles began to tighten though. However, still had a great time volunteering! Some quick fuel, mexican food compliments of the race and then drove 4 hours back to Tucson. Next race is the Firecracker Tri at the UofA.